Once you decide to start saving kitchen scraps for composting, you are presented with a new quandary: what do do with all of those scraps. Unless you don't mind running out to the compost ​pile every time you peel a banana or make a cup of tea, you'll need to find a way to store those scraps until you add them to your compost. Here are a few ideas. If you need to store your kitchen scraps on a countertop, the aesthetics of your container are important. Compost crocks may be the perfect solution for you. They are generally made of stainless steel or ceramic and are unobtrusive on a countertop or island. More importantly, crocks usually come equipped with charcoal filters to prevent the crock's contents from smelling up your kitchen. Crocks are not necessarily cheap; most models cost between twenty and sixty dollars. Compost pails are a good solution for those gardeners who have an area in a cabinet or pantry in which to store their kitchen scraps. Pails are a bit larger than crocks and are usually made of steel or plastic. The plastic options are, obviously, less expensive than the metal ones. Some of the metal pails incorporate filters similar to those used by compost crocks. The plastic ones prevent odors from pervading your home via air-tight lids. Prices for pails run between ten dollars and fifty dollars. If you don't produce a ton of kitchen waste during the day, a simple plastic or steel coffee can will work for you just fine, and it's free! Be sure to save the lid, and you have a very handy kitchen scrap containment system. Coffee cans can be stored in a cabinet or in the refrigerator. Storing the can in the fridge will help keep odors under control, especially if you make a point of emptying and rinsing the can every day. If you buy laundry detergent in large bulk-sized buckets or have a five-gallon bucket left over from your last painting project, you have a perfect receptacle for your kitchen scraps. Simply wash the containers out, save the lids, and start adding your kitchen scraps. Because these containers are so large, you may be able to go a couple of days before you have to empty it into the compost. The only problem with this is that odors can build up in the bucket. If you have some Bokashi mix on hand, you can sprinkle some of that in every time you add scraps to control odor. Plastic bags are everywhere. If we can find ways to reuse them around the house, that would be a very good thing. You can store kitchen scraps in plastic bags in your refrigerator and then empty them out into your compost pile or worm bin at the end of the day. 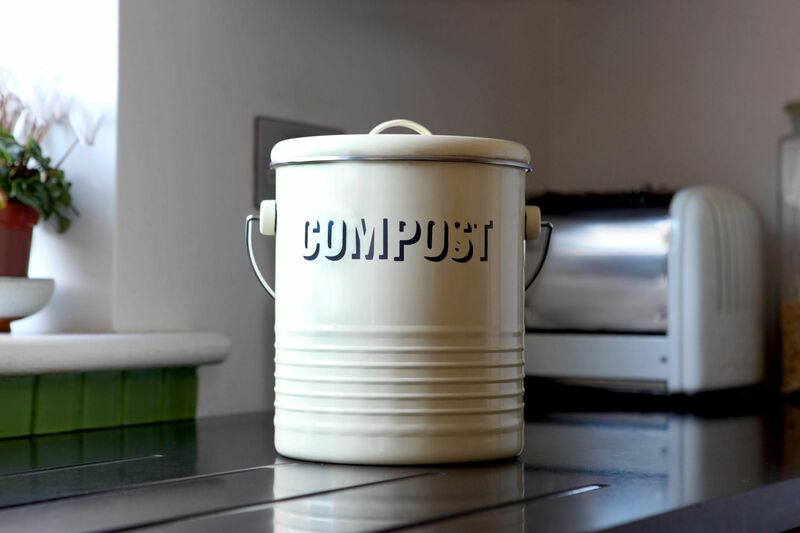 Alternately, if you are storing up kitchen waste to start a compost pile in the spring, you can freeze it in a plastic bag and empty the contents when you are ready to build your pile. The nice thing about this is that not only are there no odors, but the kitchen waste breaks down faster in the compost pile after having gone through the freeze/thaw process.